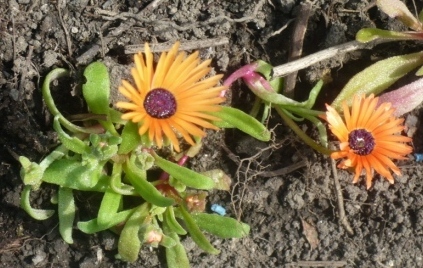 The Livingstone Daisy, or Mesembryanthemum crinifolium to give it a posh Latin name, is a bright multi coloured annual that has leaves like a succulent. Sometimes the vibrant colours are just too much of a good thing and I was please to find seeds were available in single Orange and Apricot colours. May be other ranges will soon follow. These ‘Apricot Shimmer’ seeds were sown in late March in individual modules and planted out at the end of May. The seed was last years so I wasn’t sure about germination rates but with so many seeds in one packet (2000+) there is no need for concern and each module has several seeds. Mesembryanthemums can be tiresome to prick out so I don’t bother, just nip out weak plants to get one per module. This makes them easy to plant out too. In summers gone-by my wife has spent hours individually separating and planting Mesembryanthemums. Inside a week the plants are a host of flowers and they look very good in a block of one colour. Now I have to find a colour that will contrast with them as they are quite in-your-face. Your time is more valuable than the price of a packet of seeds. You don’t need 100% success rate from seeds your garden probably isn’t big enough. A good big one beats several small ones.